PITTSBURGH – It was chilly, but sunny in Pittsburgh this weekend at the Steel City Showdown, where sixteen college teams faced off in a mid-fall battle to tune up rookies, practice defenses, and get ready for some big upcoming tournaments like CCC. If you had come to Pittsburgh on Saturday to watch Pitt, one of the most dominant college programs of the last five years, take on pool play at Steel City Showdown, you would be forgiven for thinking they were a team that struggles to make Sunday at Regionals. After failing to bring the intensity against a Delaware team that started playing clean and scoring effectively in the first round, Pitt was downright bad against Eastern Michigan – turfing the disc, throwing into coverage, and failing to make adjustments. And it wasn’t just their rookies struggling. Big names like Pat Earles and Trent Dillon had poor games and the whole team looked out of sync. They finished Saturday 1-2. Cut to Sunday. It was like watching an entirely different team. After comfortable wins over Shippensburg and Case Western Reserve, Pitt faced off against EMU once again in the finals. With the wind dying down, both teams’ offenses were impressive at the start. A tighter offensive line that often featured Earles, Dillon, and Max Thorne was clicking all game for Pitt as they largely dominated a fading EMU defense. The teams traded to start, with EMU’s Johnny Bansfield and Pitt’s Earles trading big huck blows. Bansfield, who was by far the most impressive thrower at the tournament, was bombing forehands all weekend and kept EMU out in front of Pitt early in the final. Earles, a dangerous lefty, continues to wreak havoc against a flick force in the new college season, firing big blading forehands right down the sideline on a line. Pitt was very comfortable on offense to start the game and finally broke through on defense when Sam Van Dusen got an enormous layout block on EMU’s first in cut off the pull at 6-6. Pitt scored easily to take their first lead of the game and secure the first break. That point opened the flood gates. An EMU turn on the following point gave Pitt a chance to take half. Sophomore Jonah Wisch, a standout rookie last year, ripped a forehand to Christian Pitts for the 8-6 lead. EMU looked like they might have a chance to get back into it when they broke out of half to make it 8-7 after a Pitt drop, but they just couldn’t sustain any defensive pressure. Pitt rattled off three straight thanks to better, no-around marks and a backhand force that limited the damage that Bansfield and the EMU handlers could inflict. “Their backhand force changed a lot [compared to Saturday’s game],” said Bansfield. Van Dusen had a nice assist to make it 11-8, and then Carl Morgenstern hit Pitts for the four point advantage. EMU did get one back when Dillon threw too high for his receiver and EMU’s Austin Engel took over to punch in the break, but Pitt cruised to a 15-11 win from there. Pitt did have the advantage of playing very close to home, whereas EMU was traveling with about 18 players, half of which were rookies. EMU ran extremely tight lines against Pitt in both games, mostly keeping their fourth and fifth year returners on the field. Bansfield took just a few points off all weekend. But credit to Pitt for an excellent game plan and good adjustments. After struggling to contain EMU hucks in the first game, they effectively slowed down the around throws that were setting them up for the deep shots and did a much better job of helping over the top to create double and triple coverage situations. Finally, they found their “sweet spot” against Penn State and carried that momentum into Sunday. “We’ve never done a great job with sideline, full team inclusion,” he said. “And we’ve been working on that. And I think we did that today.” He emphasized how important it is that they train their mental game early in the season. Surely the skill is there for this team to be outstanding again this season. When they all played together on offense on Sunday, Earles, Thorne, and Dillon were excellent; they had great support from Joe Bender and a mix of others. Standout rookies Kyle Hartley, Matt Hanna, and Andrew Lehmberg – who have already made the team (others are still trying out) – combined on the last point of the finals for a 1,2,3 punch up the sideline and into the endzone for a break score. Lehmberg, out of New Jersey, was particularly impressive on the weekend. With the rumored return of Marcus Ranii-Dropcho and Aaron Watson (who both have fifth year eligibility) floating in the background, Pitt looks poised to, once again, be a force come Spring. The Classic City Classic delivered a great mix of high level games, rookie development, and fun matchups among teams from across the Eastern United States. With nearly every major Southeast team in attendance and a strong out-of-region field, we were treated to a great early look at many of the country’s most competitive teams. As always, there were plenty of surprises and “upsets” – if you want to call them that in the fall – as teams made a name for themselves at what may have been the fall’s most competitive tournament. Every team has a story – we try to tell some of them here. Read more about Pitt in the recap of their win over Georgia in the CCC final. Pitt played just two weeks ago at the Steel City Showdown. Though they won the tournament (despite a downright lousy Saturday), they struggled to maintain high-level play and veered in and out of playing too loose and playing too tight. Certainly the talent was there, but the pieces weren’t really put together. While Pitt’s Saturday at CCC still showed some emotional swings, they were thoroughly prepared to face their toughest challenge of the day: Florida State. They crushed a strong FSU team 11-4 and, among the 14 or so teams I watched significant time from on Saturday, were the obviously most polished and skilled team at the fields. But Pitt’s emotional high in that FSU game was followed up with two big letdown games against quality opponents – one against NC State (Pitt narrowly won 13-12) and one against Tennessee (Pitt lost 11-8, ceding the pool victory to Tennessee). All day Sunday, Pitt brought their A game. And none of their opponents could touch it. They ran away from UNC and Georgia, and used a hot start against Michigan to hold off a strong effort from MagnUM late in the game. “Today I think we made some huge mental adjustments for our program as a whole,” Kaczmarek said after winning the final on Sunday afternoon. Pitt’s offense is deep and talented at running their system – Pat Earles and Max Thorne will be a constant headache for teams, and Joe Bender was a grinder downfield. More impressive was the Pitt defense, which was so much further along than most other teams’ that it will probably warrant additional analysis in a future article. Trent Dillon was stifling against handlers like UNC’s Jon Nethercutt, and the overall team defensive scheme was bottling up every offense they faced. Carl Morgenstern and Christian Pitts have emerged as elite individual defenders as well. Of course, it’s the fall, but it’s hard to overstate how dominant Pitt looked for the big games against top teams. They were more impressive overall than UNC was last year at CCC, a year in which UNC made it to the National final. There’s a lot of season left, but expect to see a lot of Pitt deep in tournaments. ATHENS – Max Thorne had six goals and an assist and Pittsburgh never trailed Georgia in the Classic City Classic final, taking the tournament title with a 15-10 win on a sunny Sunday afternoon. Pittsburgh was locked in from the start of the day, using an aggressive man defense to stifle downfield cutting and applying pressure to resets. Breaks came early and often; Pitt had four first half breaks against Georgia. “We’re just trying to be the best team we can possibly be,” said Pitt coach Nick Kaczmarek. Georgia spotted Pitt an early lead after a drop on the second throw of the game. Georgia kept it close, tying the game at 2-2 with an impressive Shawn Paul sky over Carl Morgenstern, but then let off two more breaks as Pitt extended their lead to three. In that Pitt 3-0 run, sophomore Jonah Wisch had a goal and a catch block while providing a steady backfield hand after the turnover. Georgia’s Elliot Erickson prevented a fourth straight score for Pitt when he laid out to intercept a crossfield throw in the endzone, but gave it back two points later when he made an amazing catch only to throw it right to Morgenstern looking for the assist. Pitt finished the half up 8-4; Georgia did not score a break. The second half was a much better showing for Jojah. They broke to start the half after Pitt’s Jimmy Towle misread a fading outside-in flick to the break side. Then Georgia held on their next offensive point with another big sky from Paul and a Nathan Haskell assist to a laying out Elliott Erickson. Georgia hurt their comeback chances after gifting Pitt another break with a dropped pull, but did string together a nice 3-0 run to pull back within two at 10-12. Mike Peters ran down a beautiful huck for the first break, then standout rookie Sebastian Di Francesco found Sam Little for the second. With a roaring pro-Georgia crowd now fully into the game, Pitt stood tall. They held on offense then scored two straight breaks – again thanks to excellent reset defense – to close out the 15-10 win. “We really got up for each situation,” said Kaczmarek, referencing their much more consistent high level play on Sunday. He emphasized their focus on having a consistent mental focus, regardless of the competition. Tactically, Georgia will need to improve its defense to really compete in the Spring. They struggled to put pressure on Pitt or UNC in the two losses they took this weekend. Pitt’s offense made mistakes, but was rarely forced into them by Georgia’s defense. But some of the credit has to go to Pittsburgh’s offensive line. There is obvious chemistry and the top players are running the system very effectively. Only Michigan’s tricky zone defense gave Pitt’s O much trouble on Sunday. Pitt walks away with a big fall crown and a growing sense that the team’s ceiling is very high. This year’s team is clearly much further along than it was at this time last year. But there’s a lot of time until the College Series. 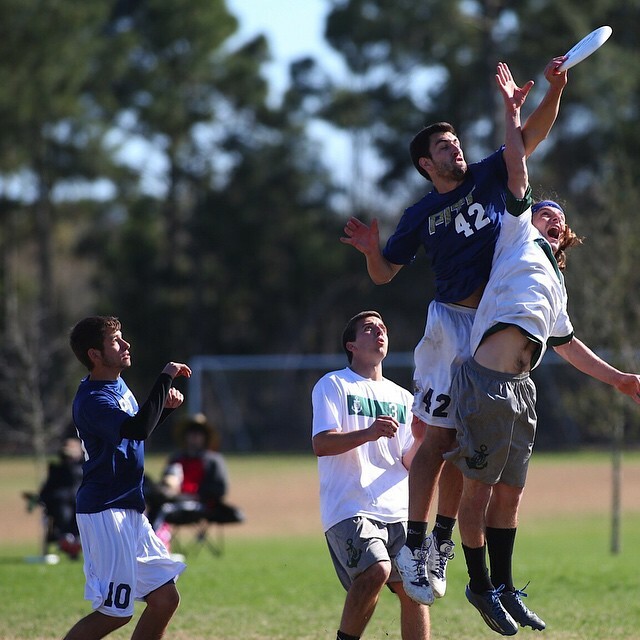 North Carolina’s Jon Nethercutt sent Darkside into the finals with this throw on double game point. The matchup against Wisconsin-Milwaukee was an opportunity for veterans and less experienced players alike to get acquainted with each other and a lower quality opponent. It was clear from the start that the two U-23 stars on the team, Logan Pruess and Kevin Brown, could not carry the cinderella team over the solid team defense of Pitt’s starting and secondary defensive lines. 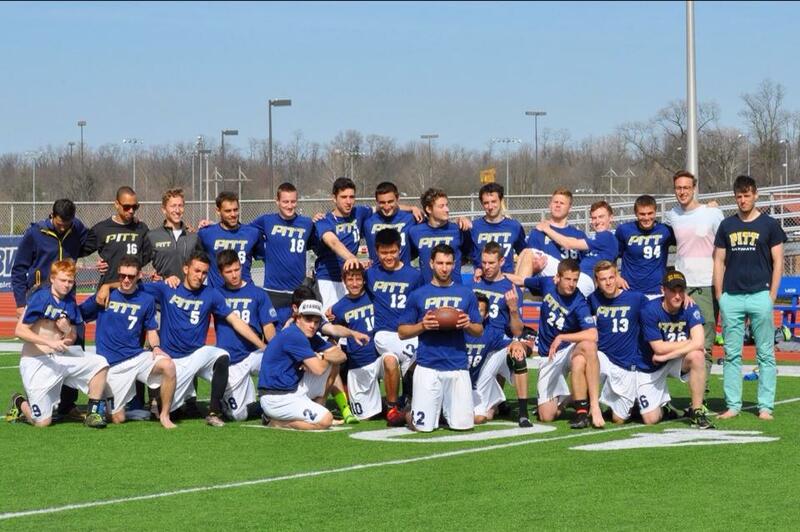 Pitt threw poaches against the better throwers to get the disc out of their hands and into the hands of their less experienced players. Pitt’s offensive unit didn’t have much trouble converting their possessions into quick scores with little defensive resistance. Throws were crisp and clean, and the game was over before it really began. A game that began with a handshake line before the first pull, day one’s matchup against Wisconsin would prove to be Pitt’s toughest test of the weekend. The wind played a significant factor from the first pull and presented a heavy upwind/downwind game that rewarded throwers for experience and poise as well as lucky punts. Both teams’s offensive lines struggled to maintain possession throughout the game. The game’s final stat line ended with more defensive breaks than offensive holds both because of careless throwing errors and lackluster downfield cutting. The defensive units for each team however, had a field day. Pitt’s D varied between fast break attack offense on a turn and slower methodical movement to convert breaks while Wisconsin did the same. The game ended on universe, with both teams turning the disc multiple times before Pitt found the downwind endzone to end the game. 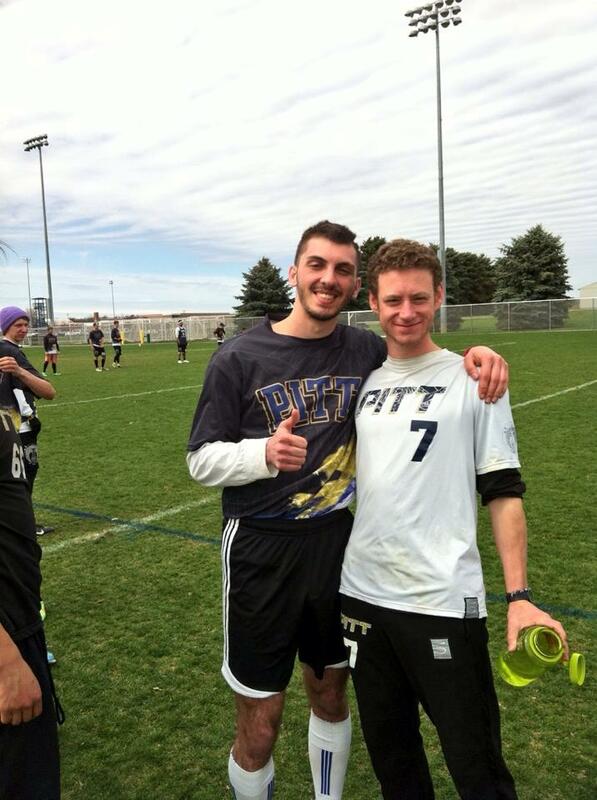 It is a widely held conception that the Pitt/UCF rivalry has blossomed into one of the most exciting match ups to watch in all of college ultimate. Unfortunately for spectators of Friday night’s showcase game, this turned out to not be the case as Pitt dispatched UCF handily. While Pitt was coming off a three round bye, UCF had just expunged all their energy into a universe point comeback win against Carleton. Pitt quickly rattled off several early breaks and never looked back. In a game that should have played to UCF’s strength-Hucking with little wind resistance- they just could not find a rhythm. While externally defeated, UCF also managed to implode internally as players argued back and forth loudly after several points in the second half didn’t go their way. Pitt coasted in the second half after taking half 7-3. Day 2 found Pitt trailing to a team they have historically had trouble with. Where Texas A&M usually disrupts Pitt’s flow with junk and zone defenses, their approach to stopping Pitt’s offense was to play tight man to man and force execution mistakes in vertical space. They went up early and took half on Pitt who had not trailed at halftime all weekend. This was a tale of two halves however as the second half erupted with a string of Pitt breaks that quickly put the game out of A&M’s reach. Pitt never looked back and closed out the game with a comfortable margin of victory. Tufts never really presented a challenge for Pitt in what was one of the least windy games all weekend. Tufts runs through two key players on offense who made plays all over the field, but eventually the switching downfield defense from Pitt proved too difficult to continually navigate. Pitt’s offense struggled to score on their first possessions, but an inexperienced defensive line for Tufts failed to convert turns into breaks. Pitt’s depth on defense carried the team in the second half and put the game out of reach and gave starters some much needed rest. Pitt always plays South Florida at Warm Up, and has never lost to the the host team. The game was business in general for Pitt, who outmatched USF in just about every facet of the game. The game abruptly ceased in the middle of the second half where a gruesome USF injury caused both teams to take a knee for 15 minutes. A fire rescue team came and immobilized the leg and carried the player off, who reported later that he was ok, but the rest of his season had come to an end. Pitt handled the rest of the game after re warming up. Texas’s sheer size and speed posed a significant threat to beat Pitt’s switching man defense and short starting offensive line. After Pitt’s decision to go upwind on offense to start the game, they found themselves in a 2-5 hole early. Pitt clawed their way back to take half however from some inspired play from the defensive line which strung together four straight breaks to end the half. The second half saw a more poised and experienced offensive line hold up until the end of the game where Texas broke to get the game to universe point. Pitt’s patient handler movement however proved too much, as the veteran line surgically moved the disc upwind for a flawless score. Sunday morning began with another cinderella hopeful Arizona State hoping to play spoiler to Pitt in the semifinals. Despite some extracurricular uncharacteristic trash talking and unsportsmanlike behavior from both sides, Pitt took half handily 8-3. The second half found ASU struggling to match Pitt’s athleticism and speed on offense and intensity on defense as the score gap continued to widen as Pitt sailed comfortably into finals. Although widely publicized and commented upon, Pitt’s “signature” win against FSU was not unlike Pitt’s dismantling of other opponents all weekend. The upwind/downwind style of game favored Pitt early, who rattled off three successive breaks to blow the game open early with a 4-1 lead. Just as they had done all weekend, Pitt’s offensive unit struggled little to score on one possession and when they did turn it, excellent lock down defense got the disc right back. Pitt’s second defensive unit also closed out the game by punching in the final downwind break and ending the perfect tournament run for Pitt, the first time the program has ever done that in it’s history at Warm Up. After the boys from Pitt ultimate were able to enjoy the change of scenery that the balmy 70s West Coast had to offer, they got up nice and early (5:45 am) and prepared for the highlight tournament of the spring thus far. Stanford Invite has long been one of those elusive tournaments that Pitt has reached finals of many times, but failed to cap off those games with tournament victories. They faced a familiar opponent in the first round in Stanford Bloodthirsty. Although the fields were covered with frost and the air hung at a frigid 40 degrees an hour before game time, Pitt began with the same sense of preparation they began all tournaments with. Pitt’s D-line would struggle to find its footing early on in the game due to the still wet grass, and Stanford’s execution on the Pitt’s offensive line would result in a one break lead early in the game. Pitt would settle into its own before half and used that momentum for the rest of the game to generate the breaks they needed to win. From the 5-2 lead early in the game to the 6-0 run in the second half of the game, Pitt found themselves easily in control of the game. Defensive pressure on individual match ups and from others poaching off their men and helping in space made the defensive effort truly holistic. From the marks to the offensive efficiency on a turn, Pitt found ways to fluster Rutgers in just about all facets of the game. The Pitt O-line was also flawless, only giving up a few turns, and no breaks throughout the game. Having beaten Texas on universe point only a few weeks prior at Florida Warm Up, Pitt was visibly excited to replay their rival for the pool. Warmups were fast, light and energetic. Players worked on unconventional throws in 3v3 and warmed up their short field shuffling. The pre game preparation showed up early in the game as Pitt quickly jumped out to a 4-0 lead, and never looked back. Although it seemed that Texas was ravaged by injuries across the board, Pitt did not relinquish the defensive pressure, or offensive efficiency. Even late in the game, Pitt’s second defensive unit took note of the intensity established in the first half, and poured on the pressure in the second half, generating individual plays as well as systemic team pressure D’s. Because of the shift in daylight savings, Pitt arrived to the Stanford fields surrounded by total darkness. A darkness that wouldn’t lift until twenty minutes before game time. The last time these two teams met at Carolina Kickoff, the final result was a one goal universe point win by Pitt. Auburn is a young team with athleticism across both offensive and defensive lines, but not a lot of depth. While the early parts of the game were dictated by slips and falls by both teams on the morning dew, Pitt went down a break early, and looked to its defensive unit to pull them into halftime. Good help defense, well timed switches downfield and a callahan from Jonah Wisch helped Pitt’s D-line do just that taking the game into half up 8-5. The second half brought more of the same, a consistent offensive unit led by veteran decision making and explosive playmaking on the defensive side to bust the game wide open. Pitt and UW had not met in the last five years of competition, and I would need to consult the records to see if the two teams had ever met. Nevertheless, playing a fresh opponent felt invigorating and inspired perhaps the most tactically successful defensive effort of the entire tournament. Two straight breaks from Pitt’s defensive line were due to suffocating underneath defense, and heads up help defense that tracked down two huck turns. UW would not go away, and broke back on Pitt’s first offensive possession as a result of an overthrow, but Pitt’s D continued to pour it on. From starters to substitutes to depth players, everyone coming on the field made an impact. The point just before half pinned the UW o-line deep in their own end zone and flustered their vertical stack with an expert three pronged tree poach that stifled the downfield options. The result was a quick huck turn, followed by the final Pitt break into half 8-6. The second half allotted a few early breaks for Pitt who with a comfortable lead, were able to rest their defensive starters in anticipation for the finals match. 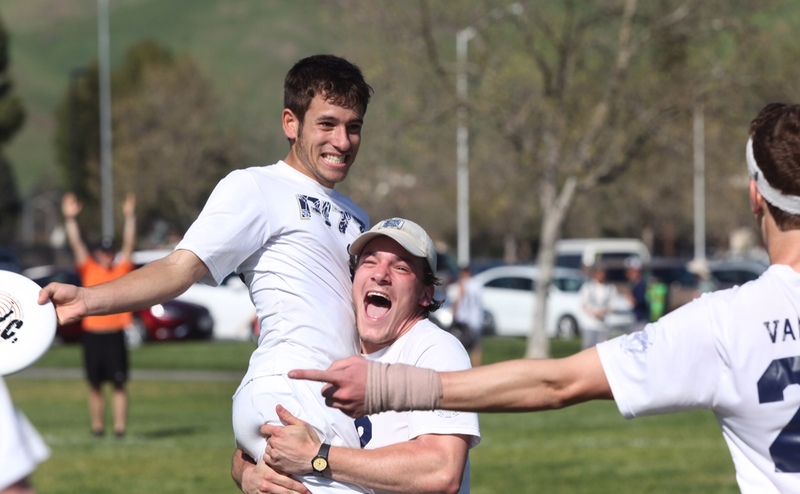 Joe Bender and Max Thorne celebrate winning the Stanford Invite 2015. In a heavily anticipated matchup that featured the #1 and #2 teams in the country, The first half didn’t disappoint with pinpoint throwing from both teams offensive units and not a single break. Pitt’s D-line forced multiple turnovers across three possessions, but found only miscommunications and execution errors on the other end. The first half ended with Pitt up 8-7, but with visibly much more energy than a depleted 18 man Oregon roster. The first break would be the backbreaker for Ego, and at 10-9 Trent Dillon got a huge hand block on Dylan Freechild that was easily worked into the end zone finally by a poised offensive effort that ended with a hammer to Dillon. Pitt would break again, mounting the lead to 3, which proved insurmountable from a physically and mentally worn down Ego team. For the first time in Pitt Ultimate history, we were crowned Stanford Invite champions, something I have wanted to do since I came here five years ago. 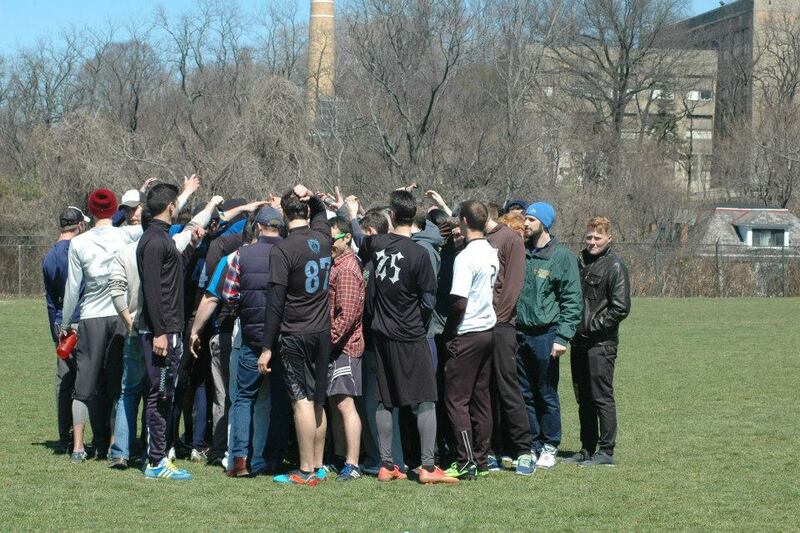 Easterns 2015 began the same way that Easterns 2014 did; playing Illinois in the first game on Saturday morning. A season that found cold early morning weather as the status quo continued in Myrtle Beach. The temperature made throwing and catching difficult, which plagued both teams early. Early break opportunities were squandered by Pitt’s defensive line by offensive miscues. However, the O-line held strong throughout the game, only getting broken once in the second half after the game was out of Illinois’ reach. The defensive line battled through windy conditions and connected on a few misreads by the Illinois defenders to punch in crucial early upwind breaks. An exciting matchup against a team known for riding the coattails of their stars by completing highlight reel plays. Georgia’s motivation to topple the #1 ranked team in the country was palpable from the start, as aggressive athletic defense caused multiple early offensive miscues from a line that held perfection as the standard. Thankfully, ultimate is a team game that relies on offensive proficiency and defensive efficiency as two parts to make a whole win. Pitt’s D line began to break down Georgia’s offensive schemes, blanketing star receiver Elliot Erickson with switches, poaches and frustrating junk looks to stop pull plays. By the time Pitt’s offense found their rhythm, the defensive unit had put the game out of reach. Easily one of the strangest and most defensive intense games I have ever been a part of, the third round matchup with Carleton College continued a storied rivalry between two perennial nationals contenders. Pitt’s O was relatively unchallenged by Carleton, their only mistakes their own execution errors. Pitt’s D line on the other hand, despite averaging 3 turns per point, could not find a way to put the disc into the end zone. Many times their possession consisted of one throw before giving the disc right back to the offense. The playmaking abounded on both ends of the field. Multiple layout D’s came from Pitt, sometimes more than one in a single point. Pointblocks also came from Carleton, sometimes more than three on a single point. Either attributable to poor offensive execution, or dialed in defensive pressure from both teams, the game was an exhilarating one to behold. Despite the back and forth battle, it was clear that Pitt could outlast Carleton on the longer points due to their conditioning, and eventually the Carleton O relinquished their fire on both sides of the disc. Pitt knew what was coming at the very start of the game. The wind had gradually been picking up intensity all day, and UMass was renowned for their zone defense. Especially their defensive playmaker Jeff Babbitt. You would think that it would be in Pitt’s interest to keep the disc away from him as much as possible. Instead, they threw it right to a bidding Babbit on the sideline, a turnover that would later turn into a 1-0 UMass lead. From t here, Pitt’s offensive zone efficiency would improve, the zone failing to give them trouble again. Impressively, Babbitt played all but one point the entire game, which ended in a 15-10 Pitt victory. Oftentimes he looked gassed playing on the offensive possessions, but to play 24 points in one game alone is something not seen in the college division. Wisconsin, a familiar opponent from years past, but more recently from Florida Warmup gave Pitt’s D trouble. Many possessions ended without a single turnover, and most ended with a successful huck goal. Both teams traded until halftime, neither defensive line able to break the other team upwind. Gusts picked up right where they left off Saturday afternoon as upwind hucks were difficult to control or even attempt. Finally at 7-7, Pitt put on a kill line that got the crucial upwind break that was the difference int eh game. The game was a tale of two halts, as Pitt piled on two more breaks to further cushion their lead and coasted out the win. Another familiar opponent from Warm Up, FSU seemed like a much more polished team than they were a month ago. Throws were more crisp, decisions were more refined, and the ability of the offense to get the disc back after a turn was much improved. Pitt’s D continued to struggle to put in break opportunities and threw multiple discs away on miscommunications and execution errors. Pitt’s O, especially Max Thorne was incredibly crisp, encountering little resistance and often finding the end zone in a few throws. The second half encountered more of the same type of excitement that bolstered the Carleton game spectatorship. Lots of Huck turns, athletic defensive plays and point blocks abounded for both squads and the score was close late into the game. Some fortune went to the Pitt side on a late game break thrown by Sam VanDusen. The high flick, thrown upwind caught a gust and elevated over three players except the eventual recipient, a stationary Jay Boyle in the back of the end zone. That break proved to be the last of the game, and kept the game out of arms reach of a tenacious FSU. Pitt defeats UNCW on double game point. This game was a total blur. That would seem like an interesting concept considering it was the longest running game of the weekend, ending in a score of 17-16. Truth be told, the second half was just such a back and forth battle on both sides of the disc, that score wasn’t something that crossed a lot of players minds. The situation was obvious, on serve for the majority of the second half, Pitt’s D needed to punch in a break to take the lead and wrestle the game out of UNCW’s hands. Time after time however, and turnover after turnover, the D unit failed to capitalize on opportunities to do so. It appeared that the problems that plagued the D’s offensive unit all weekend were manifesting themselves in new and profound ways. Poaches were coming out of nowhere, resets were not getting off, and players just were not making the conscious decision to run and make space for those around them. Finally, at 15-15, Chrsitan Pitts came down with a disc in a pile to put Pitt fifteen yards outside the end zone and then Jonah Wisch made perhaps the play of the game, saving an errant throw in the back of the end zone for the break to give Pitt the lead for the first time in the game. Pitt then held on their next offensive possession with calm collected zone offense to give them their third straight tournament title of the 2015 regular season. 2015 Alumni game. More photos on fb. D-1 West Penn Conference champions. Although not many teams gave Pitt a challenge in the windy conditions that beset Shippensburg, Penn State consistently put pressure on Pitt’s Offensive and Defensive units. In the round robin matchup under the lights, Penn State took an early 5-4 lead in the first half after Pitt’s D-line failed to convert multiple breaks in a row. Penn State keyed in on Pitt’s offense early, forcing them to turn multiple Hucks, and converting the breaks immediately with Hucks of their own. The second half however would belong to Pitt’s D line, who broke three straight times to close out the game on defense, with impressive deep looks, and over the top pin point hammers, their dynamic second half offense. The championship game against Penn State offered more of the same, but with Pitt breaking several times early on in the game to put the sectional title out of reach. 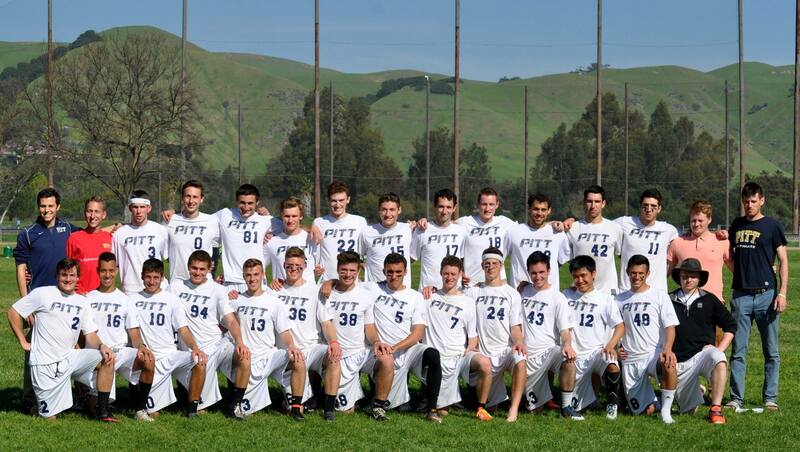 In an overall windier game, Pitt’s disc skills stood out on O and D lines, as upwind breaks came throughout the game. Singling no player out, the fifth straight conference title was easily put away by a Pitt team functioning on all cylinders. D-1 Ohio Valley Regional champions. Without a competitive game on Saturday, Pitt’s ability to play at a high level would be tested against a Cincinnati team that pummeled regional contenders Penn State and Lehigh easily in their semifinal and pool play matchup respectively. The sunday matchup didn’t disappoint, with Pitt starting on offense against a tenacious and unrelenting Cincinnati defense that forced multiple possessions. Saul Graves had the play of the tournament, saving a certain Cincinnati goal with an impressive layout D. After converting the offensive point, Pitt’s D wasted no time gaining the advantage, breaking Cincinnati several times early gaining a comfortable 4-1 advantage. Cincinnati refused to go away however, clawing their way back with a few breaks to make the game close at 5-4 Pitt. After taking half 8-5 however, it appeared that Cincinnati didn’t have the personnel to counter Pitt’s defensive pressure. Every in cut was contested, Cincinnati was only able to work it up with tight break throws around overly angled marks. Their offense was patient, and at times methodical. Pitt put the game out of reach late in the second half, and Cincinnati rested their starters for the remainder of the game. Final score, Pitt 15 Cincinnati 8. 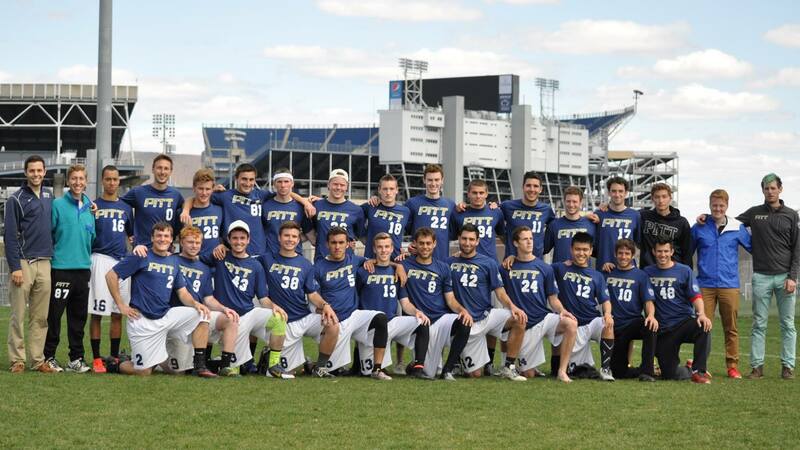 Pitt, for the twelfth year straight, punched their ticket to nationals. 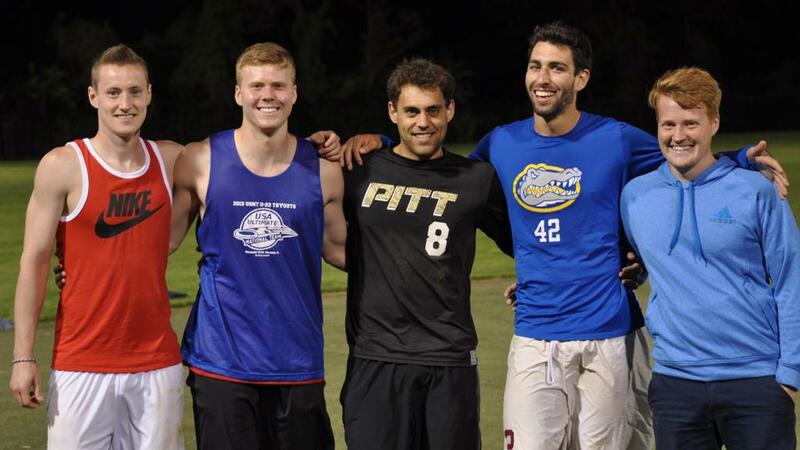 Pitt Ultimate graduates: Stephen Shaw, Daniel Wickens, Tyler Kunsa, Ryan DelCasino, and Marcus Ranii-Dropcho. UGA gave Pittsburgh quite a scare in the mornings first round for Pool A. Max Thorne began the game with two straight turns, giving the underdogs an opportunity to take an early lead. Throughout the game, Elliot Erickson was maxed out for UGA, playing nearly every point and taking the toughest of matchups. For the first half, the offense won the superstar matchups, until Trent Dillon was able to get a layout D on Erickson, leading to a break for Pitt. At times in the first, Pitt’s offense looked the worst it has been all year. In the second half, the real offense showed up, and it was nearly unstoppable. The close final scoreline doesn’t reflect how dominant the Pitt D was in the second half in part because of UGA freshman Nathan Haskell’s ability to reel in high stall hucks. With the majority of the UGA O-line playing both ways, they couldn’t muster up enough tenacity or energy to stop the Pitt O. Earles made an upline cut for the game winning goal; what started as a mess of a game ended with a silky smooth Pittsburgh O. The tournament favorites have been taken down by the 13 seed, Texas. The game began with easy offensive holds. Texas came down in a cup zone, and Max Thorne put up a big crossfield hammer to Tyler Kunsa. Kunsa catches it easily, not knowing that he’s out of bounds. The Texas D-line converted, as they often do, and Pitt was trailing. For the rest of the half Pittsburgh would have more than enough chances to get the break back. Four turns by the Texas O-line didn’t matter when the Pittsburgh defense rushed their decisions and couldn’t catch up. Texas took half 8-7. The story continued into the second half: Pittsburgh’s D-line couldn’t take advantage of chances. After a short time out from injury, Max Thorne returned to both the O and D lines. However, at 12-10, Pittsburgh had converted none of their eight break chances. Suddenly, Pitt got a break back. And on the next pull, Earles covers the reset handler perfectly and got a quick bookends. Double game point. Making matters worse, Texas got their third TMF for a dangerous bid, meaning they had to begin their offense in the middle of their own endzone. Texas rushed their first offense possession with a big huck that led Dillon Larberg too far. But the same story repeated itself when Pitt couldn’t convert on defense for the break. Texas held, finishing 2/4 on break chances, while Pitt finished 2/11. Texas will now take the pool. 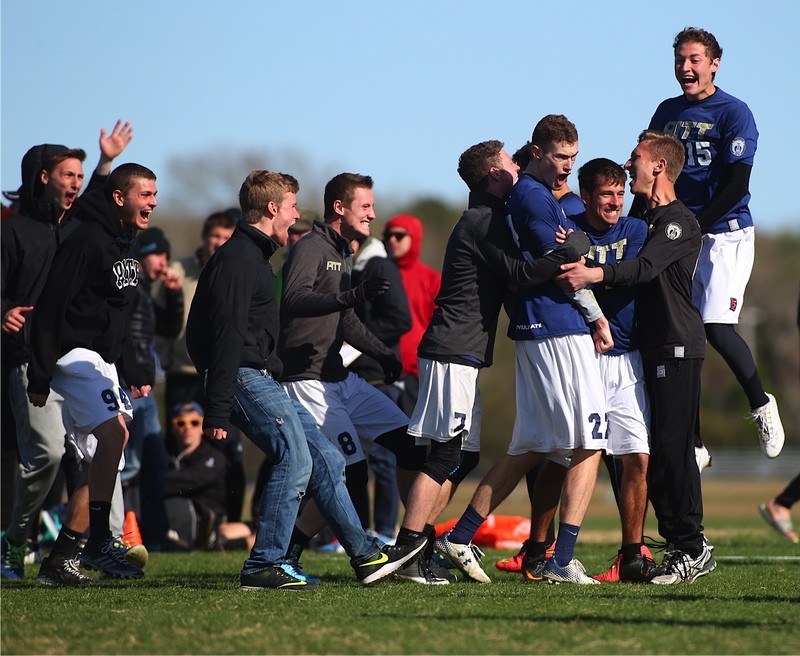 Going into Regionals, Pittsburgh and UNC Wilmington were the top two teams in the country, and since Easterns it has seemed that these two teams were destined to clash at Nationals, but not on the second day of play in prequarters. Wilmington’s spotty play and Pitt running into Texas’s buzzsaw on Friday afternoon put the top two teams in Ultiworld’s power rankings in a win-or-go home game much earlier than either team could have anticipated. The recent history between these two teams is legendary, from the skirmish at 2013 Nationals to last year’s insane quarterfinal matchup; when Wilmington and Pittsburgh meet, something incredible is bound to happen. Mental focus and composure would play a big part in the game, and both teams knew they needed to be on top of their mental game if they were going to come out ahead. For Wilmington, that meant not being intimidated. For Pittsburgh, they would need to rebound mentally from a loss, which was not something they had much experience with this year. Pittsburgh had not lost a game since January, and the team appeared visibly shaken after their defeat at the hands of Texas. The game started off at a fever pitch, with a long first point in which each team took several early stall hucks. Pittsburgh O-line, which had been unflappable all season long, missed on multiple open looks on the first point alone. On the third point of the game, Pitt’s O-line got broken after a throwaway from Pat Earles after a miscommunication. For a team that had been so solid on offense all year, this really looked out of character. Pitt would get their break back two points later, as Marcus Ranii-Dropcho got a block on a big shot from Cale Ward and Sam van Dusen gave Trent Dillon a chance to make a play. He made a spectacular catch, coming down in between two Wilmington defenders, then quickly dishing a give and go for the score. Both offenses started to calm down and covert once they got their feet under them. At 5-4, good dump defense by Pittsburgh’s D-line forced a turnover on a swing, but Pittsburgh’s D-line could not convert. They would pay the price for their profligacy, as on the next point it was Wilmington’s turn to get a chance to break. Max Thorne tried to squeeze an around flick down the sideline but it didn’t have enough underneath it. Off the reset, Xavier Maxtstadt went upline and delivered a monstrous I/O flick huck that found its mark for the break. Wilmington would get another break to take half when Saul Graves of En Sabah Nur turfed a centering pass off the pull. It was 8-6 Wilmington at the intermission. Mental strength and composure has been a big part of Pittsburgh’s focus this year, and entering halftime down a pair to their fiercest rival would be as big of a mental test as a physical one. Coming out of half Pitt threw out their kill line, their top seven defensive players. They managed to get the disc after an errant huck went just too far for Austin McGrayne and then score on a huck of their own to Trent Dillon for a critical break. The teams would trade holds for the next several points, until Ranii-Dropcho got the best of Jack Williams in the endzone on a huck from Hancock, and a few throws later Trent Dillon came down with an incredible grab in the back of the endzone off a Pat Earles huck to even the game at 10-10. The next two points ended up as holds, but each involved multiple layout D’s, huge hucks, hotly contested calls, and ever mounting tension. At 11-11 Pitt came down on D with a force middle look that forced a turnover on a swing. Sophomore captain Jonah Wisch picked up the disc and launched a flick to Christian Pitts, who boxed out his defender and came down with the disc in the back of the endzone. Wilmington responded to the break by shooting deep again; this time it was Jack Williams putting up the huck to Erik Esposto. Ranii-Dropcho was helping deep and snuffed out the throw, then scored on a dish from Trent Dillon that gave Pitt another break and the 13-11 lead. Wilmington had melted. A miscommunication led to a quick turn as Maxstadt threw to an in-cut that was in the process of going deep. A moment later, Dillon was delivering a perfect around backhand to Dylan Best who caught the winning goal and left Wilmington stunned. It was a game with the intensity, narrative, and emotional stakes of a final, and just because it happened in the prequarters doesn’t diminish that one bit. These two teams were headed for an epic showdown all season, and we got exactly that, just a bit earlier than expected. UCF remembers well their blowout loss to Pittsburgh in the 2013 National Championship final. UCF still features plenty of starters that played pivotal roles in that game: Jeremy Langdon, Brawley Adams, and Alex Bullock, among others. Today in quarterfinals, UCF finally exorcised some demons in a nearly flawless 15-9 win. “We wanted a little revenge,” said sophomore standout Michael Fairley. Pittsburgh started on defense, and came out with an aggressive mindset. It was clear from the beginning that Pitt wanted to play UCF’s game and beat them at it. They wanted to be loud, aggressive, and energetic, not the typical style you see from Pittsburgh. Early on, it worked. Trent Dillon got wide open on an iso cut, and when he caught the goal he gave a look to the UCF D-line that was palpable from the sidline. But you can’t do that to UCF and get away with it. Pittsburgh had taken advantage of the Dogs of War’s only turn, and UCF wasn’t able to force errors, even though the defense was tight. “They’ve been our biggest mental hurdle in our programs history by far. If theres any team that beats us better than anyone else, it’s Pitt,” said UCF coach Andrew Roca after the game. This time, they were prepared for the challenge. The Dogs of War spent all of last night strategically preparing for Pittsburgh, figuring out their matchups and how they were going to run their offense. They weren’t scared of the team that seemingly had their number. Defensive pressure from UCF forced an O-line turn from Pitt. Pitt hadn’t faced a team that takes advantage of opportunity quite like UCF. Brawley Adams hit Jeremy Langdon for the first break to put the game back on serve. A Pat Earles backhand huck sailed too far the next point, and UCF had another chance. Alex Bullock hit Michael Fairley, and UCF went up a break. Andrew Roca threw his clipboard into the air in celebration papers go flying. Nick Kaczmarek told his sideline that Brawley Adams is a “shooter,” a big thrower. Brawley accepted his title with open arms, vocally making sure the Pitt sideline knew to listen to their coach. Brawley hit Langdon again on a huge flick bomb. He would finish with five assists. Off their next O line turn, Tyler Kunsa would do his very best to stop Adams. Brawley shrugged off the foul, showing that even Kunsa’s physical presence wouldn’t be enough to stop UCF from converting. UCF rattled off five straight breaks, and took half 8-3. In the first half, UCF converted five out their six break opportunities. It’s hard to make a second half surge to come back, when the offense you’re trying to break only turns it three times. It’s even harder to come back, when you get broken out of half. “The halftime talk wasn’t anything special, just keep the energy up,” said Andrew Roca. Tight defensive pressure forced a turn, and Adams hucked for the goal. Adams would huck again for their second straight break out of half, with Fairley skying Marcus Ranii-Dropcho on the other end. Trent Dillon threw a long goal for Pittsburgh to hold, but the UCF sideline stormed the field anyways. At 10-4, with the Pitt sideline silent, the game was already out of reach. This was a game-changer for Pitt, and their frustration showed. On the final point, a third Team Misconduct Foul for Pittsburgh put UCF on the attacking brick. An isolation cut from Alex Bullock was too much for Kunsa who was forced to foul hard. As a repeat offender, Kunsa was given a Player Misconduct Foul. After the disc was reset, Kunsa fouled hard on the mark, warranting an ejection from the observers. Jeremy Langdon got the last three assists for the UCF offense. “Until this tournament we were a big question mark, but hopefully now we’re an exclamation point,” said Andrew Roca. UCF got huge contributions from their younger players, allowing their offense to rest when they needed it. Andrew McKelvey came up huge in covering the Pitt offensive stars, especially Max Thorne. Jeff Shapiro got a layout D that was another nail in the coffin for Pittsburgh. Fairley was clearly a big contributor as well, finishing with two goals and two assists. UCF will face UNC in the second men’s semifinal tonight at 9 PM EST, for a chance to return to the finals. Statistical leaders: Jeremy Langdon (UCF): 2 goals, 4 assists, 1 D; Marcus Ranii- Dropcho (Pitt): 4 goals, 1 assist. 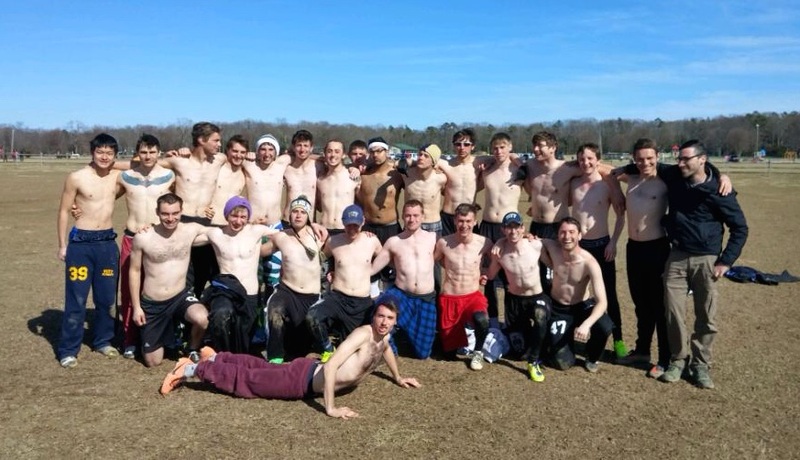 Pittsburgh-B takes 2nd at Bring the Huckus VI in Princeton, NJ. With a surprise cold snap hitting the east coast the week beforehand, Pitt-B knew that its opening weekend would be cold. The boys didn’t know how right they were. Enter New Jersey. The tournament had its fair share of drops, resulting into an 8-team 2-pool format, with Pitt-B seeded 6th (of 8) and the winner of each pool advancing to the finals. It was a balmy 18 degrees outside on this cloudy 8AM morning with no more than 3 inches of snow topped with maybe a half inch of ice. Unfortunately, Pitt forgot their ice skates at home and paid the price. Where GMU fell twice, Pitt would fall three times and so on and so forth. Soon it would be halftime 7-5 and GMU would quickly finish off the second half to end the game 6-13. Albeit quick, this game was Pitt-B’s wake up call: our opponents came to play. Relocated to an area where 3 inches of snow existed but ice conveniently nonexistent, Pitt-B’s fortune had changed. Playing with something to prove, Pitt came out of the gate hot on this cold wintery day. The boys spent little time worrying about Catholics downfield defenders and sent a few deep that connected. Fearing the deep and unaccustomed to the cold, Pitt found themselves with possession frequently and cutters shaded deep. Pitt-B took half 7-1. The second half Catholic threw an interesting zone that stifled Pitt’s offense initially, but not well enough to change the result of the game. Pitt wins 11-8 and holds seed at 1-0 on the day. Buffalo came out with force. The opposition’s offensive strategy was simple enough: break the mark, swing the disc, and huck it for the score. Coming out flat, Pitt’s offense couldn’t put it in gear and Buffalo quickly made the count 0-4. The boys call a timeout and we talk about what’s going on. Their offense was obvious enough and our offense was non-existent. Pitt proves this and makes some changes, grinding it out on offense once, then defense twice and puts the score 3-4 Buffalo. Both teams trade points to half 5-7. Buffalo receives out of half and each team’s O-Line holds to 8-6. Hard cap goes off, Buffalo scores and ends the game 6-10. Pitt learns the value of consistency, 1-1 in pool play. Starting almost immediately after the Buffalo loss, TCNJ looked intimidating as the pool leader at 2-0. However, Pitt-B began that game hungry for redemption. Going up 3-0, Pitt turned their first half mentality on its side from the previous game without committing a turnover. TCNJ ran like they were playing in the snow, but Pitt glided over the snowscape with ease. TCNJ’s handlers were identified by Pitt’s D-line and put TCNJ’s feet to the fire. Now up 5-0, TCNJ’s offense pulls through, but Pitt responds quickly to take half 7-1. To TCNJ’s credit, they rallied in the second half. Both teams felt the effects of the elements as Pitt cooled off, trading long fought points. Inevitably, hard cap sounded on a Pitt possession and the boys took the game 11-6, ending pool play 2-1 and most likely winning the pool as Buffalo and Catholic agreed that they would prefer to go home rather than play at the start of the round. After it was known Pitt won the three-way tie for the pool on point differential, Pitt-B headed to the Finals. It was getting colder and snowing; some rookies tried (and failed) making a sideline fire, touting their Eagle scout credentials. Pitt’s offense had miscues early and Fredonia simply didn’t turn it over. Playing longball, smallball, and everything in between, Fredonia’s offense was trickier than Pitt’s former opponents and the score reflected that. Taking half 7-3, Pitt looked stuck in the snow. Getting in a few final reps, Fredonia ended the game 13-6 and Pitt takes 2nd place at Bring the Huckus. The lesson of the weekend was perseverance for Pitt-B. Entering last minute as the 18th seed (of 23), the Pitt-B boys were eager to play in anything that wasn’t 4+ inches of snow. Placed in the weakest pool of the tournament with the opportunity to sneak into the championship bracket on Sunday through crossovers, the team knew what it had to do Saturday. With 23 players in attendance, Pitt-B looked like a small army compared to Boston-B’s 10 young men. Wasting no time, Pitt earned their first break off zone defense after a frustrated throw from a trapped sideline. The D-Line looked fresh and their O conversion seemed effortless. They did it again. And again. And again. Then, the O-Line tried their hand at zone, then man. Inevitably, our numbers and conditioning outpaced anything Boston-B could throw. Pitt-B finished the game well ahead of schedule 13-0. Pitt-B begins the tournament 1-0. The Westchester game felt very similar to BU-B. Zone looks dismantled WC-B’s initial offensive looks, man defense confused their timeout plays, and strong marks made forceside defense especially effective against a smaller roster. Minus a quick turn by a less experienced thrower trying a high-release backhand, the offense was relatively clean. Breakout player of the game goes to Roger Xue, whose points and D’s in this game were outstanding. Pitt-B wins 13-1 and continues the day 2-0. In my four years on Pitt-B, we’ve played Penn State four times. While I’ve grown to like PSU-B off the field, one thing remains apparent: we have not lost to PSU-B. This tradition lives on. The first point took seven minutes. They wanted it as bad as we did. We grinded through and capitalized on unders. After that first point, Penn State-B fell apart. Throwing probably our best looking zone of the day, we forced them into their own endzone multiple times and they seldom made it past midfield. When the defense didn’t force a turn on the endzone, the offense exploited the breakside. When the handler set didn’t throw breaks, it was either a strike or wide open under to space. Final count: 13-0 Pitt wins. We end pool play 3-0 with a nearly flawless differential of +38. Another (near) annual matchup, our four year record against Westchester is 1-2. Knowing this would be our first challenge of the tournament, we braced ourselves for impact. Westchester spent no time setting the tone by going up three breaks, putting the count to 0-3. Calling timeout, we had a serious talk in the huddle about what it meant to be playing this game. Time to start playing our way or end up written off. And that’s how it started. We score on O then lock in two breaks. Then we go back and forth until 6-6. Roger starts his engine and burns rubber for an outstanding D that’s converted to take half 7-6 with the bookends. The game becomes a battle of grit and hard cap goes off at 10-9 Pitt, Westchester’s ball. Westchester hucks it. Pawlush learns to fly, leaving his feet for the D near Westchester’s endzone. Bozich picks it up, finds Pawlush 20 yards upfield. Bozich dances with his defender and roasts him another 20 yards for the upline strike. He sees Boone going to the corner of the endzone and puts it up. Going through three defenders worth of traffic, Boone comes down with the disc to win it 11-9 Pittsburgh-B. For the breakout player award, I would give it to every rookie that played it in that game; Hafeez kept it fresh on O, Jennings played D out of his mind as well as a layout to score off a layout D from a Westchester defender, Roger had at least 3 D’s (6 if you count contested “fouls,” the poor boy), Pawlush had the clutch layout D to secure the final possession. We played towards our potential and take the day 4-0, headed to pre-quarters Sunday morning. Sunday morning began cold and windy, meaning our zone would be the go-to on D. Unfortunately, Bowdoin’s zone O ripped apart our cup for an early lead on upwind points. We would never recover the necessary upwind breaks and the championship dream died with the count at 6-13 Bowdoin. 4-1. Knowing Westchester had already defeated Siena helped morale heading into this game. Our offense looked great up and downwind, thanks to lax defense and Pitt’s zone returning to its effective form. Pitt takes half 7-3, but Siena wants to make it a game and gets really chippy. A few foul discussions devolved into a Siena player exclaiming, “I don’t care what you think. Send it back.” With our feet to our fire, we take some shots and the game ends 13-11. Neither team ended up particularly happy, but Pitt picks up the win and moves on to the game for 9th. 5-1. Clearing our heads, Pitt-B entered this game with smiles on our faces. We talked in our post-game huddle about mental toughness and integrity in our play. Resolving to hold ourselves to our own standards, we entered the fray going back and forth to 5-5. Recognizing an inexperienced thrower, Pitt poaches an easy D in the forceside lane for the first break of the game: 6-5. From here, Pitt’s O-line would stumble and Rochester takes half 7-6.Out of half, both teams would slug out long points back and forth in the wind until the game ended 8-10 on hard cap after a last minute score by Pitt-B. Despite the loss, every Pitt player was either smiling or laughing as we entered the post-game huddle. Each point is earned, and that lesson will carry over to the remainder of the season. Pitt ends the weekend 5-2 in 10th place (seeded 18th). Coming in as the one seed, Pitt-B had expectations: win and win well. With six games of pool play, Pitt-B came into Saturday to work on consistency and mental toughness. UMU didn’t warm up and they couldn’t handle Pitt’s zone looks. Quick transition offense and standard zone defense was the story of this game, which ended 13-1. PITTB starts 1-0. Cincinnati-B came out hotter than expected in the first half, but Pitt took half 7-4 from smooth offense and pressure Ds. Alternating zone and man D looks to identify handlers, Pitt stifled Cinci by containing the pull play and shutdown man D on the ins for the rest of the game. Pitt took this game 13-6, 2-0 on the day. Pitt entered the game with the challenge to block the in-cuts until they prove they can huck it deep. Defensive strategy, combined with breakside offense, yielded the necessary results. Dayton scores on a misread deep and bad pull, Pitt wins 13-2. 3-0 on the day. The first half of this game was the lowlight of the day for Pitt-B. Scranton ran a strong zone look and Pitt couldn’t seem to outpace the cup. Down 3-5, Pitt comes roaring back to take half 7-6. From there, Scranton looked gassed and led to a few injuries on their end, probably from playing a well-conditioned team of 23 versus their 9 players. Pitt-B puts the foot on the throttle and finishes the game 13-7. 4-0 Pitt. Another case of “shade in until they prove they can huck it,” Pitt played phenomenal handler defense and the Oberlin handler set looked rattled by half with the count 7-1. Finishing the day with more open lines, Pitt’s offense left something to be desired, but nonetheless took it 13-2. Pitt goes undefeated on Saturday 5-0. Georgetown-B came into this game looking really pretty on offense. For the first time, Pitt’s defense just didn’t cut it. Tied 4-4, Pitt D finally kicks it into gear and breaks 5-4. And again 6-4. And again 7-4. From there, Georgetown just didn’t look the same and Pitt wins it 13-5. 6-0 in pool play. UCF came 16 hours north to play Pitt and they certainly proved that in their gameplay. UCF threw a stagnating junk D that Pitt’s O just couldn’t figure out with the crosswind. Sloppy drops and what-ifs on Pitt O couldn’t stand up to strong breakside offense powered by strike cuts on UCF’s end. Pitt’s D looked flustered and couldn’t handle the pressure from the UCF Offense. UCF grinded out the long points and hard cap ends the game 11-6, UCF wins. In the end, we end up outplayed in a great game that leaves us wanting more. Pitt goes 6-1. Scranton forfeits in interest of time and legs. Pitt ends the tournament 7-1. 3rd Place.